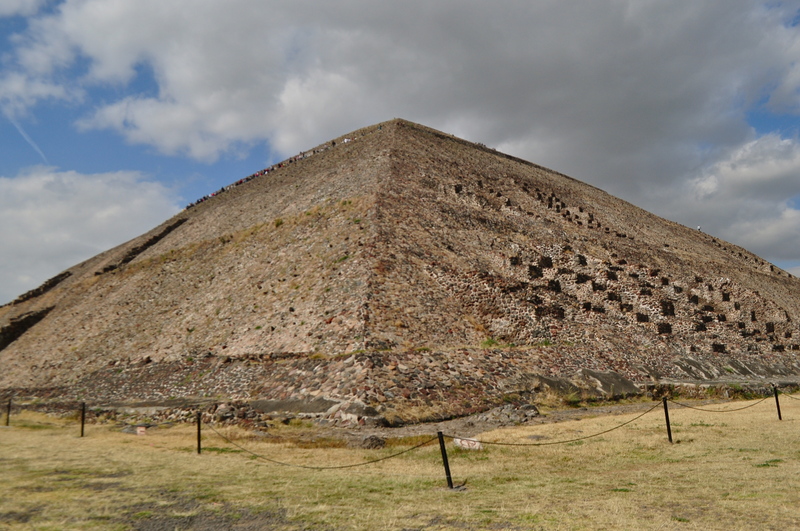 It is hard not to feel a sense of awe when you get to the sun pyramid at Teotihuacan. You drive from the modern day pyramids of Mexico city, glittery gold and silver and glass masses, down the valley and across a flat plain, weaving your way through slums and cacti and desert shrub until you see them, rising up out of the dust like beacons. Through the masses of tourists wearily stepping up the almost vertical staircase I get glimpses of what it must have been like, a millennia and a half ago , to have watched the procession of a solitary priest climb up, up, up towards heaven. He may have been accompanied by a slave, a human sacrifice that, it can only be guessed, would have willingly come with him, even found it an honour to stand on that point above the world and be assured a quick passage to the realm of the gods and an everlasting passage into the realm of men. 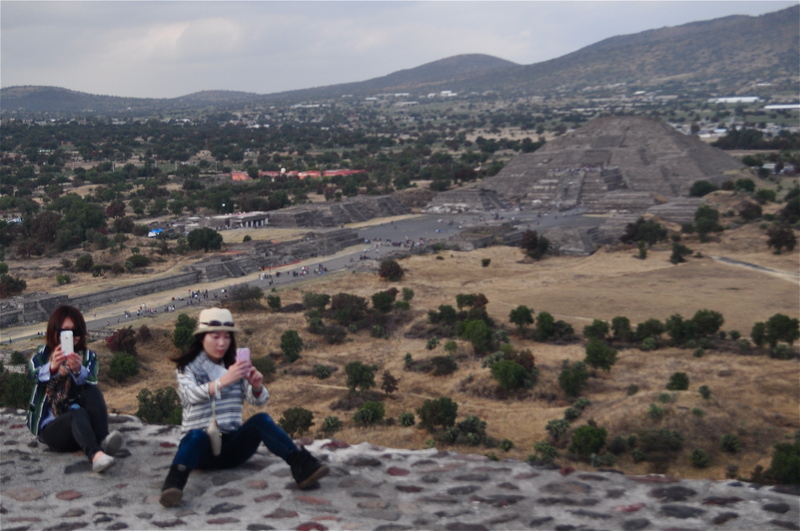 Teotihuacan was once perhaps the most powerful city of the world. 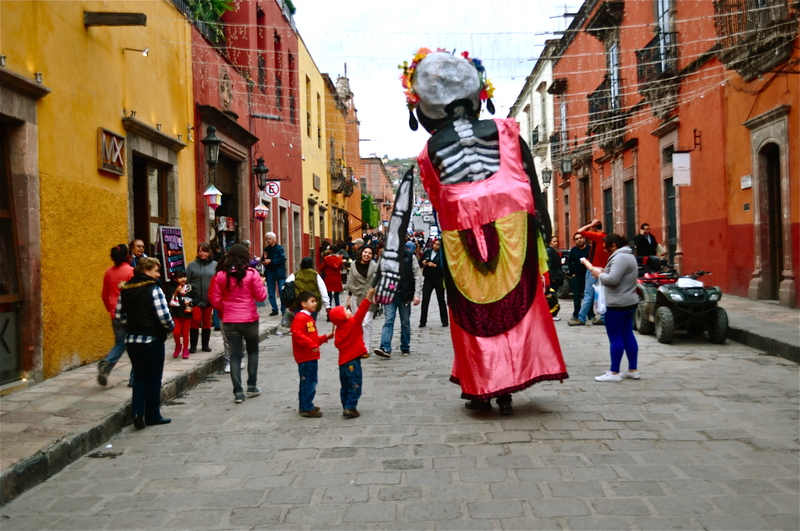 Built some 1700 years ago, the rulers quickly gained a monopoly over the obsidian mines and created a vast trading network throughout Mexico to Guatemala. They ruled as kings and gods, creating imposing and impressive monuments like the pyramids of the Sun and the Moon, large bodies of knowledge about the solar system, and large mass graves containing the remains of many hundreds of human sacrifices to win over the favor of the gods. The place may be ancient, but for me, the story is still very modern. 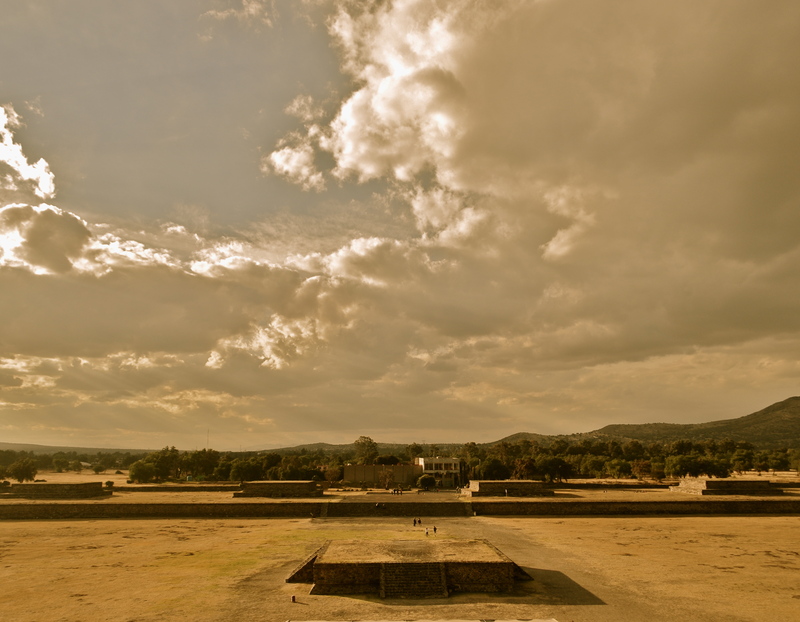 Public Plaza at Teotihuacan. The central stage was used for public sacrifices. I have just come from a short, shotgun visit to Vancouver and, after having my flight cancelled and spending Christmas at the airport in Los Angeles, have now spent the last few days with my friend and her family in and around Mexico city. It is a typical story of love at first sight; this country is bursting at the seams with history and cultures and subcultures and music and food. I am swept away by the jewellery markets, the wandering live bands, the colours, the people, the street food (how can one place have so many tastes!). There is just so much to feast the eyes, the heart, the soul and the stomach on, it is one of those places where every picture looks like you edited it with the colour saturation on high, one of those places where falling in love seems effortless. 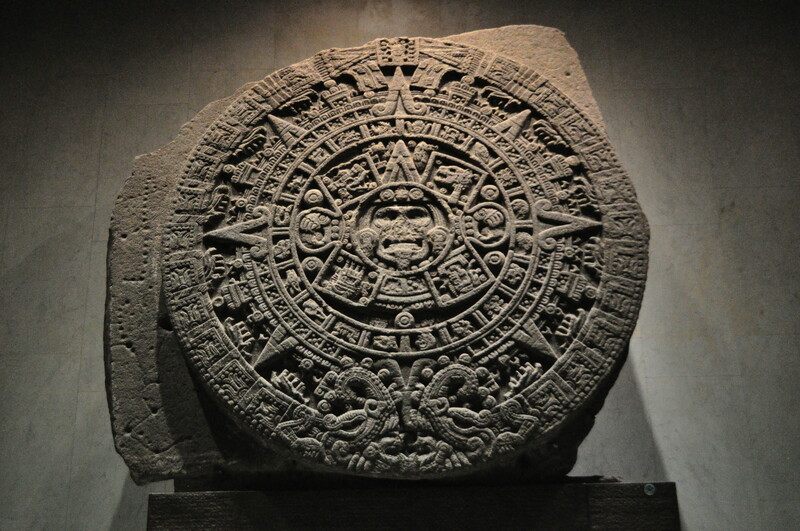 The Sun Stone, one of the most famous archeological remains. 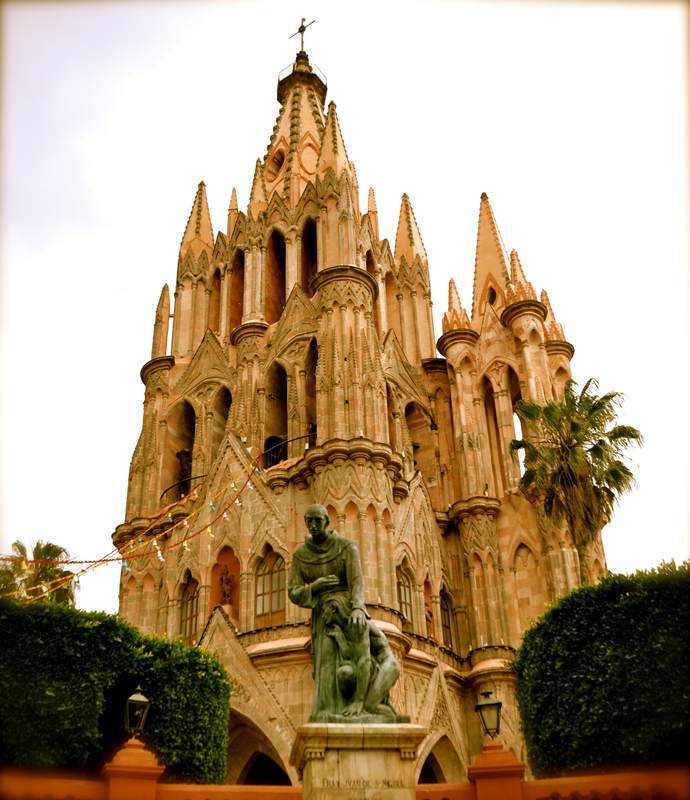 New Years was spent on a small outcropping above the beautiful city of San Miguel de Allende watching the fireworks and Chinese wish-lanterns rise above the cobbled streets of the town. It was magnificent to sit there, with two very creative and inspiring people, having conversations about past years and new years, life and love and dreams and aspirations.My life feels full at that moment, the moment feels timeless in its perfection. 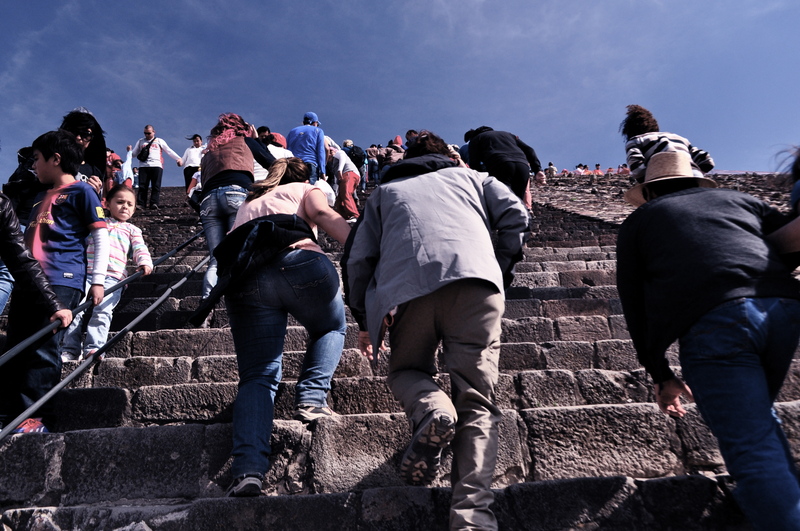 Even though today the stones of the pyramid at Teotihuacan are worn soft, the history of the place beat into the staircases by the thousands of visitors that come every day to stand and take pictures of themselves on top of the structures, 1500 years have passed and the still the desire to make oneself eternal, static is something this pyramid awakens in people. In contrast, I feel transient. I going back, or forward, depending on how you see it, to Nicaragua. Back to where my home is for the next little while, to my little town nestled in the foothills of the north. Forward towards new adventures and experiences, towards a new life, a new calling, a new year. I hope all of you had a wonderful beginning to the year as well. Wishing you a happy new year filled with love, light, and inspiration.